1000Bulbs.com is expanding its already vast inventory to include built-to-order Lithonia Lighting products as well as adding other Acuity brands to improve the customer shopping experience. 1000Bulbs.com is expanding its already extensive inventory of Lithonia Lighting products to include built-to-order fixtures. 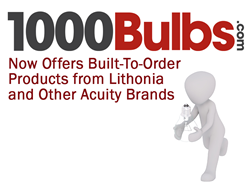 1000Bulbs.com is expanding its already extensive inventory of Lithonia Lighting products to include built-to-order fixtures and offerings from other brands under the Acuity label. Acuity Brands is the parent company of 18 brands focused on light fixtures, controls, components, and daylighting design. Specifically, Lithonia Lighting has delivered the Best Value in Lighting® for more than 60 years, providing the industry’s broadest line of commercial, industrial, institutional, and residential fixtures. Fifteen of Acuity’s brands will be available for purchase, including Peerless and Mark Architectural Lighting products, increasing the number of reliable and high quality commercial and residential light fixtures options. In addition to those product lines, 1000Bulbs’ customers can now order products from Lithonia Lighting built to their desired preferences. Lithonia Lighting’s premade inventory is comprised of the most common and often sought-after fixture specifications. However, consumers can call 1000Bulbs.com and order fixtures in a vast combination of color temperatures, wattages, lumen outputs, voltages, and finishes among other features. Each order takes an average of 2 to 3 weeks from production to delivery and there is no minimum order for custom products. 1000Bulbs.com continues to stock a widening range of quality lighting and electrical products at price points everyone can take advantage of. Along with Lithonia Lighting, we are committed to providing sustainable lighting solutions that are enabled and enhanced by LED lighting and other advanced technologies, including lighting controls. Browse our current Lithonia products online at 1000Bulbs.com or call 1-800-624-4488 to speak with a sales representative about customization options.